'Immortal Brothers: The Tale of the Green Knight' is the Arthurian legend/Valiant Entertainment mash-up you didn't know you needed. Imagine 'The Princess Bride' but featuring Archer & Armstrong - Ivar, Timewalker, and Harbinger-Faith instead. It's some stellar storytelling that weaves old and new mythology in one giant fun crossover of epic proportions from Fred Van Lente, Cary Nord, and Clayton Henry. This extended one-shot opens with a bed-ridden Faith suffering from a severe case of the flu but luckily, she's got boyfriend Obadiah Archer at her bedside. What better way to raise her spirits than to read her the 14th-century Middle English chivalric romance Sir Gawain & The Green Knight? It starts off pretty much by-the-book and then the Valiant Universe begins to inject itself into the story with great seamless humor and adventure. It's also very easy to immerse yourself into the book too without being familiar with the Valiant comic world before hand. The talents of the artists are on full display as the story is told in the present with art by Henry and the Arthurian story elements are drawn by Nord. The modern day scenes are clean and expressive as Faith looks miserably ill. Nord gets to show off his skills with mythical locales full of castles, dragons, and purple giants. There's a noticeably different approach to the art from Henry, the lines are heavier, shadows are more pronounced, but the action is fluid and exciting. Colorist Brian Reber alternates between the setting with perfectly composed color schemes for both, bright and modern for Faith and Archer, earthy and rich for Gilad's merry men. The differences are obviously stark but not jarring as they alternate at times. Inker Mark Morales provides smooth finishes and boldness where needed giving the legend portion the weight it calls for while keeping the present scenes light and defined. 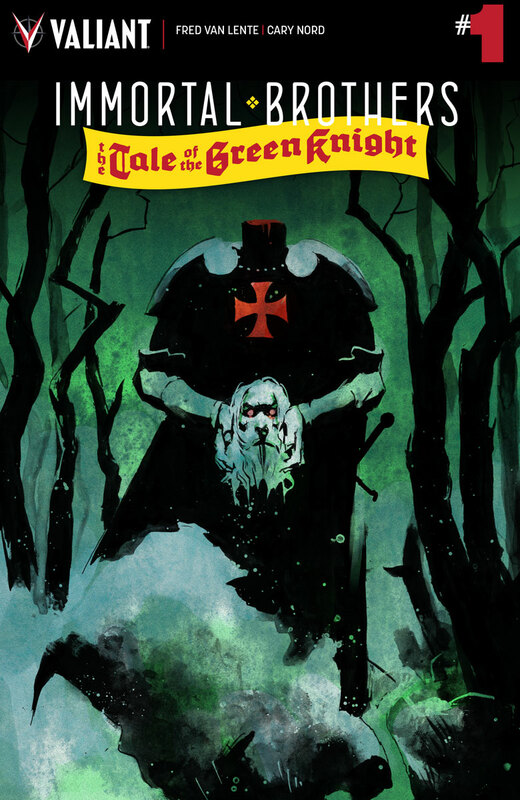 'Immortal Brothers: The Tale of the Green Knight' is a pleasant, lighthearted adventure that is thoroughly gratifying. It takes a talented team like this - Fred Van Lente, Cary Nord, Clayton Henry, Mark Morales and Brian Reber - to give this Valiant one-shot the perfect look and tone it deserves and is worthy of recommending to everyone you know.